Oceania Cruises will offer cruises to French Polynesia in 2018-2019. 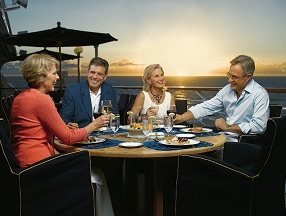 The Sirena, Regatta and Marina will offer unique South Pacific voyages. Meet over cocktails in Martinis and recount your adventures ashore. Strike up a conversation pool side. Making friends is effortless, as is finding more private areas to relax, when you're feeling less gregarious. In this inviting atmosphere, where every wish is attended to with exemplary service, it's easy to feel at home. Remembering details, such as adding a lemon twist to your favourite cocktail, or your propensity for a chilled hand towel while lying pool side, only hint at their deep commitment to your name, preferences and wishes, all in the interest of ensuring that each moment onboard will be memorable. The ease with which they anticipate your needs borders on magical. This rate talent is especially evident among the private butlers who meticulously care for guests in our Owner's, Vista and Penthouse Suites. Warm hospitality and impassioned service are the distinguishing traits of our entire staff.